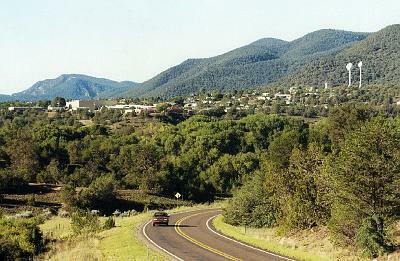 Reserve — the county seat since Catron County's founding in 1921 — was named for Thomas B. Catron, a Santa Fe attorney, political leader, and New Mexico's first U.S. senator. The town began in the 1860s when Mexican-Americans established a string of villages along the river, naming them the Upper, Lower, and Middle San Francisco Plazas. Anglo settlers renamed the Upper village as Milligan's Plaza after a merchant and saloon owner. Milligan's Plaza wasn't the law-abiding place you'll find today. In the early 1880s, Elfego Baca decided to clean up the town. Baca appointed himself deputy sheriff, rode 130 miles by horseback from the central new Mexico town of Socorro, and engaged in a 33-hour gun battle with some of the town's residents (who were anything but reserved). Copyright © 2011 by Linda Aragón. Moved to jpeek.com by permission in 2016.